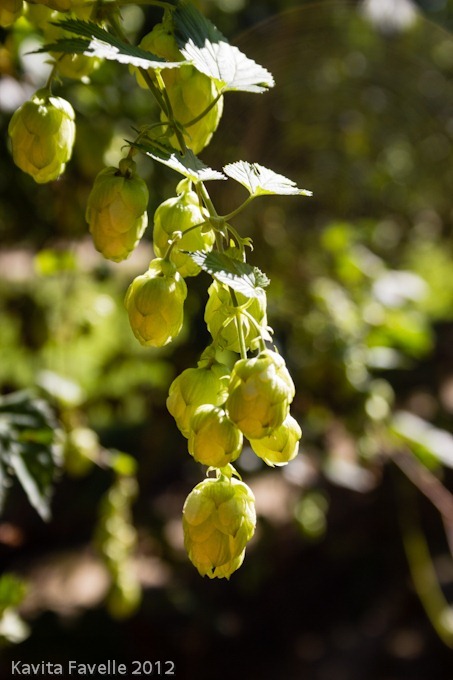 Hops are pretty important things in the world of beer (although that hasn’t always been the case). They’re so important I’ve even gone to the extent of planting my own in the garden this year. As we approached the end of summer and I was looking at my hop-laden plant, a part of me was worrying that I didn’t actually know what to do next. 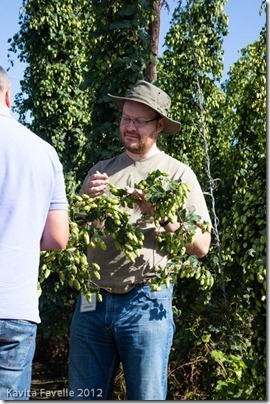 So when, with excellent timing, the nice folk at Shepherd Neame invited us down for a hop picking weekend I naturally jumped at the chance. 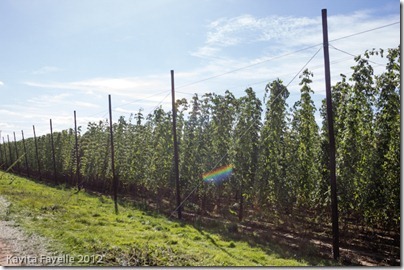 Mockbeggar Farm in Teynham has been growing hops for generations; there seem to be endless fields of towering hop bines, held up by a network of cable strung between telegraph pole-like supports and dripping with many times the hops that my poor little plant has managed to produce. 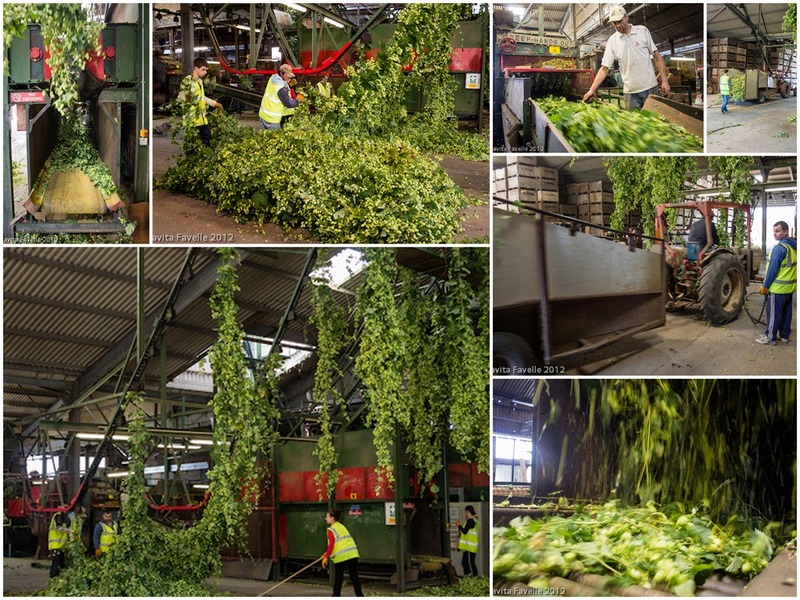 Considering how much smaller hop farming in this country is today compared to a hundred years ago, it seems incredible to think that back then, these hops all had to be cut down and harvested, by hand, and all in the space of a few weeks. There is a historic tradition of working class Londoners hopping on the train down to Kent at the end of August to help with the harvest. Although at the time it was hard manual labour, the fact that it was in the green and sunny fields of Kent rather than the grime of London makes it sound like a working holiday – although if George Orwell is to be believed, it wasn’t all good. The London we left behind is a lot cleaner than those days, although Orwell and his friends probably didn’t have to fight through hordes of Olympic visitors to reach the platform. Still, I couldn’t help feeling a slight historic resonance as I sat watching the Kent countryside rush by the window, even if my hop picking day proved to be more of a wander through the sunny fields followed by a delicious meal and a comfortable hotel bed. Of course, things are a lot less manual these days. 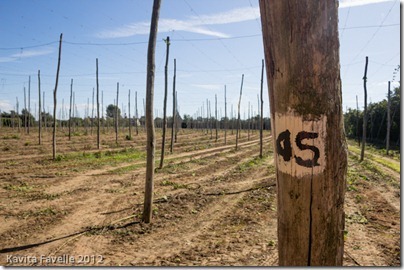 No longer do you need thousands of itinerant workers in the fields, taking the hops from the bines by hand. 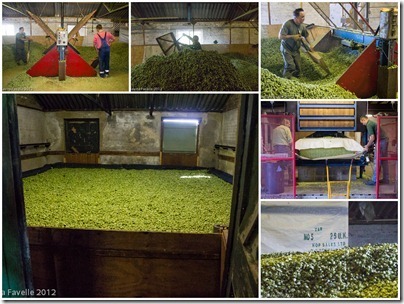 Now, the whole bine is cut down and whisked off by tractor to be mechanically processed at a central facility on the farm. These pictures really don’t do the process justice – there’s a video at the bottom of the page. I could watch this wondrous machine for hours as it somehow takes whole hop bines and spits out bare hops at the other end. I’m sure Orwell would find some dark sinister side to it, but I’m hypnotised. 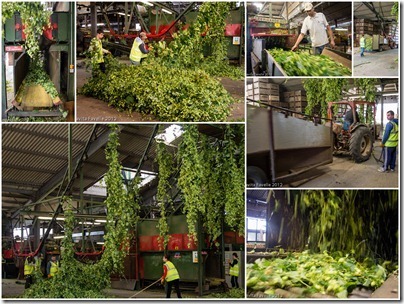 The hops are then taken next door to the oast house, to be dried and packed for storage and shipping. The oast house at Mockbeggar Farm isn’t the traditional round shape, but the process itself really hasn’t changed much in centuries. The hops are spread out on a heated floor to dry, and then compressed into huge bales ready to be sent out. 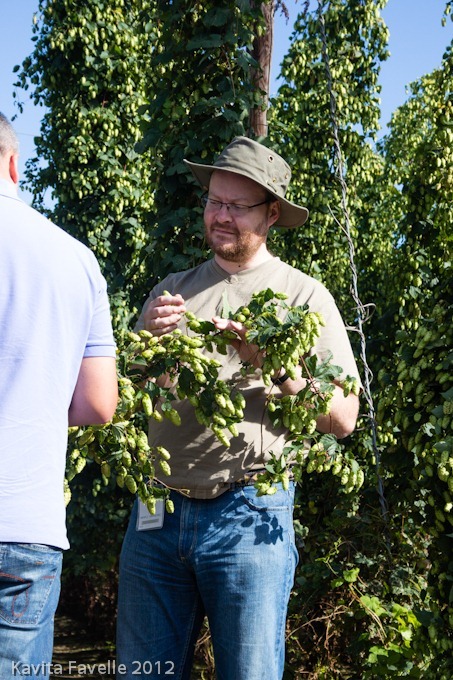 Obviously my own hop harvest was less impressive, and lacking the machinery I had to do it all by hand. 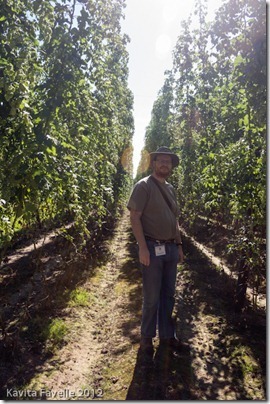 Then again, I only had to walk about 15 feet from the ‘farm’ to my own domestic oast house – in the form of the oven on it’s lowest setting with the door slightly open. 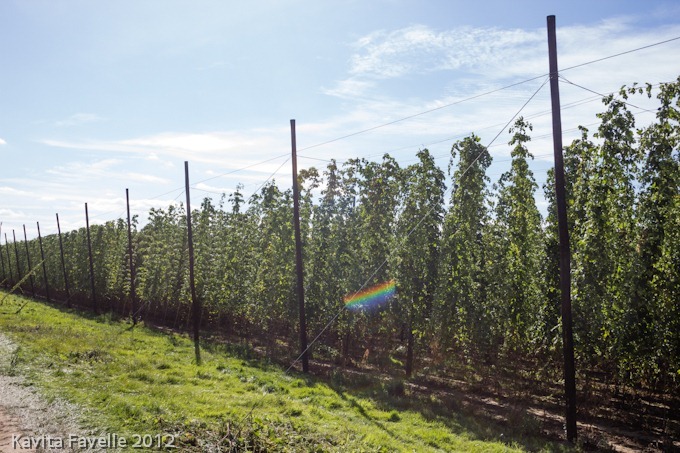 Sadly hop production in Kent – and the rest of the country – is a shadow of it’s former glory; at its peak, over 70,000 acres of the country were filled with hop gardens and these days it’s barely 5% of that. 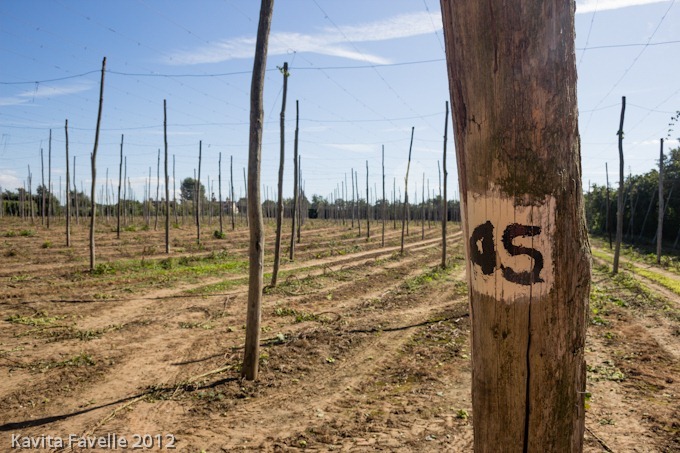 It’s curious that at a time when breweries are growing at the fastest rate for a generation, our domestic hop industry is lagging far behind. Pete Drinks visited Kent as a guest of Shepherd Neame Brewery.